For the victims of flooding in India, Bangladesh, and Nepal. Further east in Bangladesh, authorities have reported another 11 deaths taking the annual monsoon toll to 191. Disaster management minister Tapan Chowdhury says thousands of army and civilian personnel have been mobilised. Nepal has also been badly hit and its home ministry says the death toll has risen to 87. About 32 of the Himalayan nation's 75 districts have been affected. Biratnagar, a border town close to India, reported 223 millimetres of rain in the last 24 hours. I'm praying that God will bring the millions affected by this year's monsoons relief, safety, and comfort. See here. Federal law requires bridges to be inspected every other year. But Ohio does so annually. Also, see here and here. Eighty-six year old former governor of Ohio, John Gilligan, is retiring from the Cincinnati School Board, fifty-four years after first seeking elective office. In a career that included teaching English at Xavier University and Politics at Notre Dame, as well as a term in Congress and a stint as head of the US Agency for International Development, Gilligan once had realistic hopes for a White House bid. But, in a move for which some Ohioans have still not forgiven him, he imposed a state spending austerity program, most notoriously including a shutdown of the state's parks to camping and fishing, and in 1974, he lost in his re-election bid by only 11,000-votes statewide. Still, Gilligan might have won re-election in 1974 and credibly run for the 1976 Democratic presidential nomination had he not been pitted against perhaps the savviest politician in Ohio history, Jim Rhodes. Rhodes had done much for the state and was extremely popular. He was prohibited from seeking a third consecutive term in 1970, the year when Gilligan was elected to the governorship. It should be said that had Rhodes been eligible, he might not have won anyway. Just before the May, 1970 primary, in which Rhodes was a candidate for the GOP nomination for the US Senate, Ohio National Guardsmen were called onto the campus of Kent State University. Rhodes bore much of the public blame for the tragic deaths of four KSU students memorialized in a famous Neil Young's song. As a result, his fellow Republicans spurned Rhodes, nominating Robert Taft, great-grandson of a 19th-century US Secretary of War, grandson of a President and Supreme Court chief justice, son of the 1940s-50s US Senate minority leader, and father of the Bob Taft whose recent gubernatorial tenure came to a bad end. During his 1971 to 1975 tenure as governor, Gilligan pushed through and successfully defended the first state income tax. That made his austerity program all the more difficult for some Ohioans to swallow. But it turned out that, while dramatically enhancing life in Ohio with new highways, vocational and techincal schools, new businesses, and airports, Jim Rhodes had also been exhausting state resources. The state was nearly broke. Gilligan's income tax probably saved the state treasury. But an austerity program that may have had a few touches of the cosmetic cost him re-election and consideration for the presidency. It's often little things that trip up a candidate headed for 1600 Pennsylvania Avenue, things that in other times, might be overlooked. But Jim Rhodes' expansion of the state's park system had given Ohioans recreational and vacation options they wouldn't have otherwise enjoyed. Closing those parks steamed a lot of voters. Of course, there's no way of knowing whether it was Gilligan's austerity program, his income tax, or what else caused Ohioans to spurn him in 1974. It's harder to identify the reasons for a political loss when it comes by a whisker than when it's by a furlong. John Gilligan was one of the most eloquent speakers and intelligent people to become governor of Ohio. This Sunday at the congregation I serve as pastor, Friendship Lutheran Church of Amelia, Ohio, we begin a three-part series on Christians and Work. The first installment of the series will be built around two Biblical passages: Genesis 2:4b-9, 15 and Second Thessalonians 3:6-10. To help folks prepare for worship and hopefully help others who read Better Living, here are a few introductory thoughts on the two passages. 4bIn the day that the Lord God made the earth and the heavens, 5when no plant of the field was yet in the earth and no herb of the field had yet sprung up—for the Lord God had not caused it to rain upon the earth, and there was no one to till the ground; 6but a stream would rise from the earth, and water the whole face of the ground— 7then the Lord God formed man from the dust of the ground, and breathed into his nostrils the breath of life; and the man became a living being. 8And the Lord God planted a garden in Eden, in the east; and there he put the man whom he had formed. 9Out of the ground the Lord God made to grow every tree that is pleasant to the sight and good for food, the tree of life also in the midst of the garden, and the tree of the knowledge of good and evil. 1. This is part of what appears to be the second of two creation accounts which open Genesis, the first book in the Old Testament. The first account, starting at Genesis 1:1, begins with a promordial flood and over a period of six days, culminates in the creation of human beings. In this account, God creates from a desert or a wilderness, causes water to spring up, and humans are the first creatures God creates from the unpromising sand. 2. The fact that the there appear to be two different accounts of creation at the beginning of the Bible shouldn't throw us off. The Bible is God's Word to us, but given the infinite distance between His intellect and our capacity to understand, that Word is nonetheless His baby from His perspective. In both accounts, in ways that we can understand, God wants to convey the simple fact that He created the universe and made humanity for a special relationship with Him and His creation. For more, see here. 3. Some scholars insist that Genesis 2:4-25 actually describes events that should be seen as sequentially following the events recounted in Genesis 1:1-2:3. I'm skeptical of that view. 4. V. 15 demonstrates that it was always God's plan for the human race to, like God Himself, work. The human call is to take care of creation. In all our vocations--at home, at school, or on the job, this is part of our call. Far from being a punishment, work is central to what we human beings are to be about. It imbues us with dignity and purpose. 6Now we command you, beloved, in the name of our Lord Jesus Christ, to keep away from believers who are living in idleness and not according to the tradition that they received from us. 7For you yourselves know how you ought to imitate us; we were not idle when we were with you, 8and we did not eat anyone’s bread without paying for it; but with toil and labor we worked night and day, so that we might not burden any of you. 9This was not because we do not have that right, but in order to give you an example to imitate. 10For even when we were with you, we gave you this command: Anyone unwilling to work should not eat. Here [Paul] preached in the synagogue for three sabbaths, proclaiming Jesus as the Messiah, and proving from the Scriptures the necessity of his death and resurrection (Acts 17:3). Some Jews were convinced; many of the Greeks who had been previously attracted to the religion of Israel were also persuaded. A thriving new ministry ensued. Eventually however, many Jews in the city became perturbed with a movement that incorporated Jews and non-Jews (Gentiles). This group "accused [Paul] of sedition (Acts 17:7) and aroused such a disturbance that Paul and Silas were sent away by their friends by night..."
Paul's continuing concern for the spiritual development of the congregation at Thesslaonica caused him to maintain contact. The letter that appears as First Thessalonians in our New Testament was written in the early 50s-AD. Many scholars believe that Second Thessalonians was written the following year, 52-AD. (2) Paul has traditionally been held to be the letter's primary author, although because of divergences in vocabulary and its understanding of the end times (eschatology), that's questioned. But the differences aren't so great as to make different authorship necessary. It should be pointed out though that in ancient times, it was thought perfectly legitimate for persons who belonged to a school of thought established by a rabbi to correspond in the rabbi's name. On the one hand, these believers were enduring in the faith despite persecution (2Th 1:4). On the other hand, some had become frantic about the return of the Lord (ch. 2), while others had taken to living off the largesse of their fellow believers (3:6-15). Paul wanted to set the record straight. I'm praying that God will encourage those who mourn with the hope of Jesus' resurrection and that God will sustain all who involved in the recovery efforts. for Andy Jackson and his family. And for the victims of today's tragic bridge collapse in the Twin Cities. More Christians are being victimized for their faith in Christ today than at any time in history. A second of the original group of 23 South Korean Christians who went to Afghanistan to help the poor was executed by the Taliban there. Reports indicate that a rescue effort may be underway. Last week, the pastor who led the group in Afghanistan was executed. Two days ago, a member of the group, Shim Sung-min, was murdered. Pray for the safety of this group. The Taliban is an evil group which, while in power in Afghanistan gave safe haven to al-Qaida. But even in Afghanistan today, it's illegal to be a Christian and the Taliban no doubt will enjoy some popular support for their actions in spite of the motives of the South Korean group. For more information, see here, here, here, and here. My friends in AA tell us we're as sick as our secrets. I know many folks with dark secrets, and nowhere to take them. Sometimes they go crazy, literally insane, because they can't stand being alone with their dark thoughts and secrets. Or they get loaded, or get high. An acquaintance of mine ran a street ministry just a few blocks away. He had secrets about failures in his past and financial pressures in his present that he never told anyone. They bottled up inside him. One day his wife walked in the front door and found his body swaying from a rope. I cannot tell you what a blow that was for the people he ministered to. I agree with John. We can't keep secret sins or fears bottled up within us. It isn't that we should vent everything to the world, engaging in the kind of verbal diarrhea we see displayed on many of the daytime talk shows. But there is something therapeutic about exposing our dark secrets to light. Doing so can rob our secrets of their power. Once, as a young adolescent, I was dogged by a large and foreboding thought. It haunted me through every waking moment of my day. It was such a horrible thought, one I thought that no good person could entertain. It tripped me into a series of obsessive-compulsive behaviors that, owing to the irrationality that dark secrets can trigger, I thought might fend off the thoughts. Finally, one day, unable to take it any more, I went to my mother and told her what had been going on inside my head. While it must have been disturbing for my mother to hear, the moment I tearfully got the words out of my mouth, something amazing happened. The dreaded thoughts had no power over me. Exposed to the light, the thoughts shriveled and went away. I literally stopped thinking about something horrible that had hounded me for weeks. "Confession is good for the soul" is more than a hackneyed saying. It's an unalterable truth. A man I know, a responsible, loving father, not a Christian, huddled with me one night in a corner at a party. He began telling me about his past history of drug abuse and the combination of guilt and foreboding for his children that personal history caused him. He was afraid that his body had sustained permanent damage, afraid too that his past would become known to his children and blunt his efforts to keep his kids from making the same mistakes that he had made. But after recounting his concerns, without our discussing any potential solutions, a look of relief crossed his face. With a smile, he alluded to the adage about confession and said, "I guess it's true. Confession really is good for the soul!" The Bible teaches that confessing to God regarding the ways we hurt God, others, and ourselves, is an essential element to a relationship with God. To those who want life with God, Jesus says, "The time is fulfilled, and the kingdom of God has come near; repent, and believe in the good news” (Mark 1:15). The Good News to which Jesus refers, of course, is the message that God gives new and everlasting lives to all who will repent--turn from their sins--and follow Christ. I find that divulging my secrets to God, secrets that He already knows about but never forces me to discuss with Him, is always the beginning of healing from the things that might otherwise kill me--in body, mind, and spirit. First, by doing so, we acknowledge that all of us are part of an imperfect human race, each of us in equal need of God's forgiveness and equally worthy of it. Second, we deliberately set aside time to actually confess our sin and receive God's forgiveness. Third, we remind one another that confession needs to be a daily part of our lives, regularly acknowledging our secrets to God so that we can experience the healing that comes from His forgiveness. The fact that we're still alive shows that God has more tolerance for whatever those secrets represent than we may give God credit for. There's nothing we can't tell God. He's shockproof and He bears healing in His wings. Revealing our dark places to God isn't some odious duty. It's a privilege that brings renewal and life! 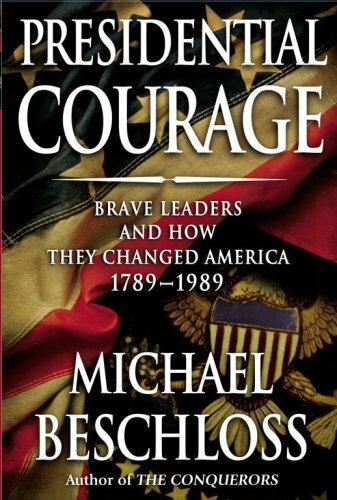 Michael Beschloss' latest book, Presidential Courage: Brave Leaders and How They Changed America, 1789-1989, is a worthwhile read. In it, Beschloss chronicles the fortitude demonstrated by George Washington, John Adams, Andrew Jackson, Abraham Lincoln, Theodore Roosevelt, Franklin Roosevelt, Harry Truman, John Kennedy, and Ronald Reagan in specific circumstances of their presidential tenures. In each instance, the Presidents profiled risked their political futures and legacies, pushing policies they felt would help the country, in spite of the fierce opposition they knew they had to withstand. In several instances, Beschloss portrays chief executives of both deep principle and great political wiliness, possessing that rare instinct for striking politically at just the right time. That's certainly true of Washington's push for the Jay Treaty with Great Britain, an agreement that many of his contemporaries portrayed as a capitulation to the one-time Mother Country. But Washington knew that the accord would give the US the breathing room needed to develop as a nation, unencumbered by conflict with great European powers. Washington endured withering criticism and unlike his unlucky successor, John Adams, who was turned out of office for his efforts to keep the young republic out of war, emerged as beloved as he had been before the Jay controversy. Washington, described elsewhere by historian Garry Wills as the greatest political figure in world history, may have had his twentieth-century counterpart in Franklin Roosevelt. FDR wasn't nearly as principled or personally ethical as Washington. Yet, this man who was both a charming extrovert and a loner who kept his own counsel, was able to negotiate the prevailing currents of American isolationism in order to prepare his country for war. Roosevelt, unlike most Americans, understood early that the territorial ambitions of Nazi Germany, Imperial Japan, and Fascist Italy would inevitably drag the United States into a world war, whether as arms supplier or combatant. As much as we laud vision in leaders, vision becomes problematic when the leader forsees unpleasant events, like world wars. One of my seminary professors used to tell me that a great communicator is one who can meet those she or he leads where they are and recognizing the variance between their positions, persuades people to gradually see things his or her way. Roosevelt was a great communicator and a great leader who, in the face of great peril, demonstrated presidential courage. Most of the presidents profiled by Beschloss had certain rock-bottom principles that acted as compasses for their actions, irrespective of the possible political consequences. One exception might be John Kennedy, who finally saw the need for a civil rights initiative--stalled in Congress at the time of his assassination on November 22, 1963--but who was never enthusiastic about it. In fact, I question Kennedy's inclusion in this book. Beschloss' book definitely aspires to be a popular history, in the best sense of that word. We need more such books, written to instruct interested adults, because, as Kennedy himself once wrote, "A knowledge of the past prepares us for the crises of the present and the challenge of the future." Beschloss writes economically. Short sentences. Short paragraphs. But each paragraph is apt to reflect a number of original source materials. He may not have an advanced degree in History and he may be viewed somewhat disdainfully by historians who see his failure to talk about the history of ideas as a deficiency, but I like Beschloss. While prevailing ideas, the metaphysics of a given time, are important in looking at historical events, people--as individuals and in groups--make or respond to events. History is really the story of the human race. In this presidential version of Profiles in Courage, a book in which Kennedy wrote about courageous actions taken by members of the United States Senate, we see how some of our better presidents applied courage to their work. With the 2008 election upon us, voters might very well ask, "When have the people seeking our votes this year demonstrated courage? When have they told constituents, friends, co-workers, or co-partisans things those folks might not have wanted to hear? When have they demonstrated that peculiar blend of idealism and wiliness every great politician...every great President...must have to accomplish great things?" Occasionally, Beschloss gives attention to the religious views of the Presidents he studies, making me think that he may be planning on writing the very book I intend to write, one on the faith lives of our Chief Executives and how faith impacted their decision-making. In an era in which faith has become controversial, this would be a welcome and helpful book, I think. Until Beschloss (or I) produce such a book, I recommend Presidential Courage. I laid low most of yesterday, sleeping a lot, due to a minor surgical procedure I underwent. I’m still not 100% functional today. The genetic beneficiary of receding gums, I received a tissue transplant for my upper gums last year. Yesterday, the doc did the same thing on the lower gums. It's not so bad. The main discomfort associated with this operation, so far as I'm concerned, comes whenever I rinse my mouth with water every few hours. That's because the procedure involves the grafting of skin from the roof of a patient's mouth and transplanting it to create new gum tissue. The first day's post-surgical bleeding and pain didn't match that of last year at all. On the first afternoon following last year's surgery, I woke up once and found blood all over my pillow. Using the old "chomp on a tea bag for a few hours" routine stemmed the bleeding quickly. At about 3:00 this morning, I woke up again. My mouth was full of blood and had to once more rinse and find tea bags. That once again stopped the bleeding. But I didn't have to change the pillowcase this time. By Wednesday, I should be able to tolerate solid foods and be back to work full swing. I fixed scrambled eggs this morning. They tasted so good after a day of just yogurt, apple sauce, and chopped fruit! When it comes to pain, I guess I'd have to say I'm something of a wimp. But most medical procedures I've undergone through the years haven't been as horrible as some friends led me to believe they would be. For example, one friend of mine, a burly, strong guy, once told me about the flexible sigmoidoscopy he'd just undergone. He made it sound like torture. "Pray that you never have to have one of those done," he told me in all seriousness. When, some five years later, my GP said that I should have a sigmoidoscopy, my whole body clenched. I went to the office of the recommended specialist, was taken to the examination room, and braced myself for the worst. Five minutes into a procedure I can only describe as mildly uncomfortable, the doctor administering the test told me, "We're done." "We're done?" I asked. "Yep." "There was nothing to that." "Not really." Two weeks ago, with my GP concerned that I might be suffering from carpal tunnel syndrome, I went for an EMG (for electromiogram) test. With electromiography, physicians can determine how the muscles are functioning...or not. The test can tell whether a patient is suffering from carpal tunnel problems. For years, people have told me how horrible the EMG test is. Undergoing the test, which entails having one's hand, arm, shoulder, and neck shocked and stabbed with needles, isn't my idea of a good time. But, except for two times when I felt quick twinges of pain, the test wasn't that bad. My point in bringing all of this up is that you can't let yourself get spooked by others' experiences of various medical procedures. But having allergies or being even slightly asthmatic, as I am, can complicate the administration of an EKG. While not in great shape, I walk a lot and always hit my recommended elevated heart rate while working out on treadmills and ellipticals at the gym. But I couldn't do much running on the treadmill when I started in on the EKG. Congestion in my lungs seemed to prevent it. Instead, I had to undergo Version B of the EKG. It's one in which chemicals are injected into a subject's veins while they sit, bouncing crazily in a chair. The technicians who worked with me, all women, warned me, "Once this chemical gets into your system, you might become really hot. It will feel just like hot flashes feel for menopausal women." Within the first twenty seconds of being injected with the chemical, my hot flahes hit. As instructed, I squeezed a rubber ball furiously with my right hand and tapped both feet like Fred Astaire on crack. Barely able to breathe, I looked at the three women monitoring my test and said with a smile, "I get it. This is revenge on men for not having to endure menopause like you." They all laughed. If I ever undergo another EKG in my life, I intend to be rested and not allow any breathing issues to keep me from staying on the treadmill. I don't want to be a chair dancer again. Others who've undergone an EKG may think that it's no big deal. And of course, they're right, I guess. But I'd frankly rather have the surgery I had yesterday...or an EMG or a sigmoidoscopy...than have an EKG again. What medical tests or surgical procedures have you had that weren't as bad as your friends billed them? What ones were worse? Not all people are called to parenthood, of course. But if you are a parent, this wise advisor was saying, if you fail at that, you’ve failed at your life’s most important work. It’s good advice. The Bible teaches that parenting is the most critical task in the world. Martin Luther was fond of saying that not even kings were as important as parents. Parents have an impact that lasts for generations, for good and for ill.
Last week, we began this short series by saying that the purpose of parenting is simple: To prepare children for responsible adulthood. And we pointed out that the most important element in that preparation is to share the God we meet through Jesus Christ with them. When kids enter adulthood with a faith in Christ that’s been nurtured in them by their parents, they’re ready to face anything that life and eternity may bring to them. Today, I want to talk about a few additional elements that the Bible teaches parents will want to use in launching their children toward responsible adulthood. Our second Bible lesson for today is one about which I’ve spoken many times through the years. I’ve usually done so in connection with prayer. In it, a man makes a desperate request of Jesus, asking the Lord to rid his son of the demon that had overtaken his life, turning him into someone else. “Please, Lord,” the father cries, “if You are able, help my son.” Jesus asks: “If you are able? Don’t you know that you just need to trust in Me, believe in Me?” The father says, “I do believe, Lord. Only, help my unbelief.” That man’s prayer to Jesus was answered, not because he had lots of faith, but because he had what he admitted was only a little faith in a big God! So, this passage does teach us about how God hears our prayers even when we’re hanging onto faith by a thread. But there’s something else going on in this passage, something that relates directly to this business of parenting. When I was just getting my start in elementary school, interested only in what I was interested in and inattentive to everything else, my Mother attended a conference with my teacher. The teacher talked about the difficulties I was having and suggested that maybe, I was mentally retarded. Now, there is no disgrace associated with mental retardation. But my mother knew that while I may have been lazy, or defiant, or not hot-wired for things like Math, I was capable of learning. Mom was roused like a pole cat and that teacher never again made such a suggestion. You see, my Mom, like the father who implored Jesus to cast the demon from his son, was an advocate for her child. No parent should ever have a blind eye toward their kids’ faults, of course. We are all born sinners and that includes every child. I've often said that if you want confirmation of the Christian doctrine of Original Sin, all you have to do is put two six-month old babies in a locked room with a single toy. They'll both be looking out for Number One and nobody will need to teach them to do it. There will be plenty of times when parents will need to rein in their kids, discipline them, and tell them, “No.” But this can be a tough world for kids. Because of that, Paul writes in the New Testament, “Fathers, do not provoke your children, or they may lose heart.” Parents need to be advocates for their kids. But parents need to display another element of love for their children. Parents need to discipline their children. There are three main reasons kid need discipline. One is that, according to the Bible, we human beings are created in the image of God. Whatever else that phrase means, it must say that you and I are born with infinite appetites. Those appetites are distorted by sin, to be sure. But those infinite appetites are still there. We’re born wanting to do everything, be everything, conquer everything. This can be good. It can lead us to try things we might otherwise be too timid to attempt. But such appetites aren't good when kids take it into their heads to do something like I tried when I was about six years old. Ever the persuader, I’d convinced all the kids in my neighborhood that we should take our pedal cars, bicycles, tricycles, wagons, and scooters the fifty miles from our neighborhood in Columbus up to my grandparents’ house in Bellefontaine, Ohio. I knew th way, I told them. Getting there would be a cinch. My Mother put a halt to this little conspiracy just as I, pedaling my red fire truck, began to lead a procession of neighborhood kids down the middle of our street, Thomas Avenue, in Columbus' Bottoms area. Discipline lets kids know that there are appropriate limits to what they can do at various points in their lives. Another important reason for discipline is that it lets children know that there are certain moral limits beyond which it’s unwise to go. Once, years ago, I stood behind a woman in line at Biggs. Her daughter, all of three years old, kept screaming for the mom to do this or that, to give her this or that. It was obvious who the real boss of the family was. Mom was like a puppet on a string. She complained about how “fussy” and “bossy” her child was, but she complied with every screaming, whining request! Kids need to know that the universe doesn’t revolve around them, that they share the world with others. Disciplining their children to understand this reality is, for parents, a moral imperative! Another important reason for parents to discipline their children is that it sets patterns for them. From discipline imposed, self-discipline is appropriated. “Train children in the right way,” our Bible lesson from Proverbs says, “and when old, they will not stray.” Discipline is one important way responsible parents get their information on their kids’ blank tapes. None of this justifies an abusive parenting style, of course. But proper discipline is an act of love that kids need and sometimes want. So, parents need to be advocates for their children. They need to discipline their children. Finally, parents need to do something else for their kids, something I’ve already touched on. They need to pray for their kids. There’s only so much parents can do for their kids. We parents have to let our children tumble and fall off their bikes; see them face the slings and arrows of outrageous adolescence; bite our tongues while they kiss frogs in search of Prince Charming or Miss Right; and always we must be willing--as every good parent must-- to endure being unpopular with our kids when we take a stand for what’s right or when we rightly demand their respect. But even if the lines of communication with kids become clogged with misunderstanding or mutual suspicion, all parents have access to a 911 operator and the Person on the other end of the line is always willing and able to help. We can talk with the God we meet in Jesus Christ. That’s exactly what the man in our lesson from the Gospel of Mark did. He cried out to the Lord, though his faith was tiny, and sought the help of the big, loving God Who wrote His love large with a cross and an empty tomb. Parenting is a huge job and the person who dares to do it without the help of God is pointblank, foolish. But the parent who tackles their awesome responsiblities by daily laying their lives and their kids before God and His help are the wisest people in the world, no matter how stupid or silly kids may think them to be from time to time. of parents recognizing the limits of their abilities and the extent of God’s compassion, and so, praying for their children constantly.